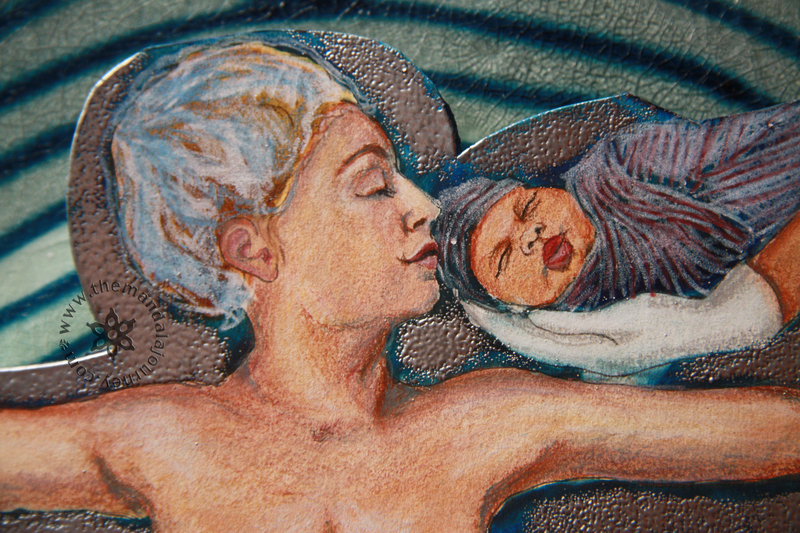 I wanted to do a piece to honor women who have given birth by cesarean. These women are strong mothers who have given much for their children. Imagery for this piece was very difficult because there are so many different kinds of cesarean experiences, from the traumatic to the tearfully thankful. I asked many cesarean mamas, both friends and members of ICAN (Int’l Cesarean Awareness Network) to share their stories with me and looked for common elements. 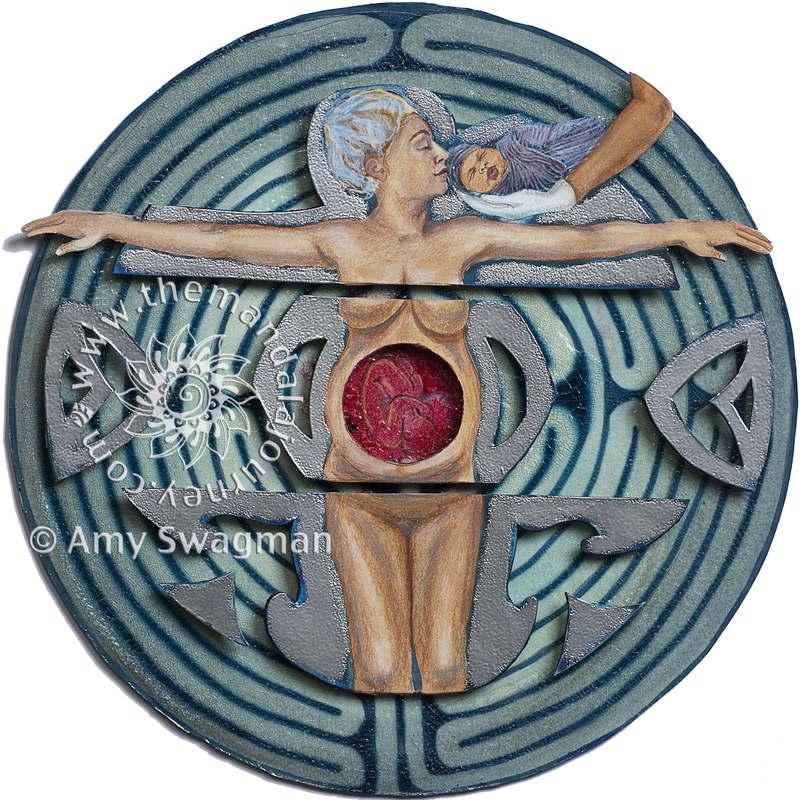 I decided to focus on the elements of the cesarean itself instead of the reasons and experiences behind it. 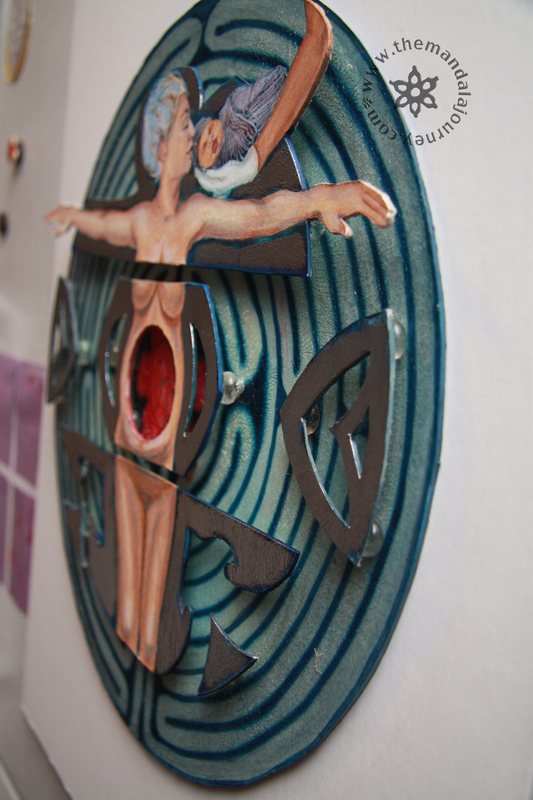 I used a three-dimensional approach to have the figure floating above the base representing the strangeness of the anesthesia. Many moms told me how they felt disconnected to their bodies by the drape, the tugging of the procedure, etc. This is why I segmented the figure into thirds where the sterile drape and the incision would be. The belly is exposed to show a shadow of a baby that was just there, the birth had just happened. It is like an echo of a baby. I set everything on top of a Chartres Labyrinth to symbolize the journey women take to arrive at this place. At the center of the labyrinth there is the shadow of the baby, symbolizing the baby’s experience of the journey as well. Some cesareans are planned, some are not, but every woman has a unique web of experiences and situations that bring her to this birth. Sometimes we know the reasons, sometimes we never know. ***Again, I want to stress that this is not *all* cesareans, just a representation of common themes. If you’d like to process your own birth, cesarean or not, through art please contact me at amy@birthingbody.org to talk to me about commissioning a piece. Thanks so much! Did you have a cesarean? 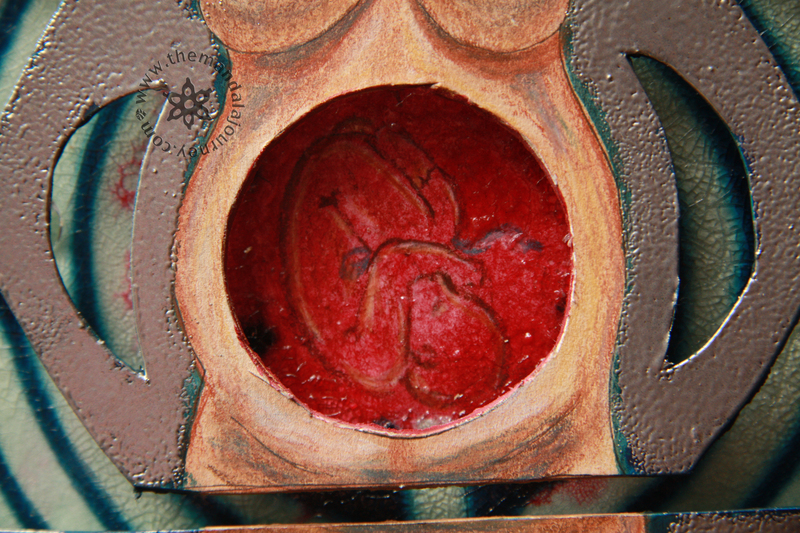 I’m speaking on birth art at the ICAN conference in April, should be really interesting! Your work is so beautiful! I was so touched by this piece. All three of my children were born by c-section. This is the first artwork I’ve seen to give sacredness to the way my children had to be born. Thank you for that! Thank you so much, that’s very touching to me! Such a beautiful thing! I had to have c-sections for all of my kids, Elspeth our first born and then Ingebjorg and Benjiman, our twins. This work of yours touches my heart so much because after the c-section I could not wrap my arms around my babies! I couldn’t even stroke them with my hands. I was drugged up and staked out like Jesus on the cross. Sadly no one ever held my baby to my lips for me to kiss. They were swept away and I was left craning my neck and begging to see but no one ever listens. I can’t use PayPal or else I’d buy a print for my wee art gallery! This so perfectly captures the experience of a c-section. And although I wasn’t able to kiss my babies with my lips I was certainly kissing them with my heart! P.S. sorry, I forgot to put my website into the box above. About time!!!! I had my twins through cesarean, very painful, very dry environment and long recovery time….But all needed! I think many women and children are able to make it because a cesarean procedure. I feel the process of having a cesarean is completely different than “natural” yet being a MOTHER is more than how your child came to the world. I heard from many women that went through water child birth, home, natural, ect…that a women that had their children through cesarean don’t know what is to give birth a child!!!! THANKS for honoring our process….!!!! Many Blessings for you…..
Uma, thank you, that means a lot to me! I couldn’t agree with you more. This piece brought me to tears. So powerful. My first C-section was with my twins and was forced on me. The arms being tied down and being unable to hold them was the worst part for me. I LOVE this. Another one who had tears in her eyes after seeing this beautiful image. The supplication of the mother reminds me so much of my powerlessness during my emcs with my son, all I could do was kiss him too. You have a rare gift and inspiring talent. Thanks. this image has me sobbing. Thank you for making this beautiful piece. Thank you! And have a beautiful Birthing Day. Also, have you seen “The Natural Cesarean” on Youtube? You should if you get a chance, it’s amazing! Oh my God. Hi, I´m an artist too, I had a cesarean. Your art is warm and just amazing. Thak you for it. Excuse my english please. I´m shocked by this image. I´m in tears. That is the visual description of what I felt in that c-section. It has been a year and I´m still recovering emotionally. God bless you work and thank you because youre not judging c-section moms. It´s hard to feel that you just couldn´t make it happen. And on the other hand see your beautiful baby just there, needing you whole. This is an incredible piece. Moving. A beautiful and strong (and real!) 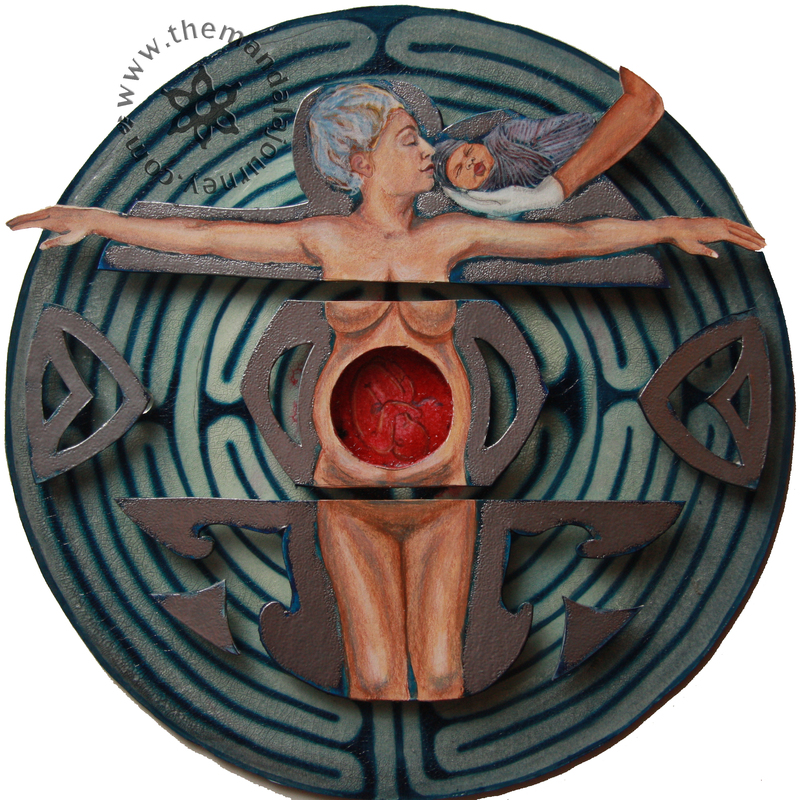 depiction of a woman birthing via c-section. All of your work is incredible. Please continue to produce your work. And to take your inspiration from multitudes of voices and stories of women and mothers. These stories need to be shared with the world. Very powerful. Very much what I experienced in birth. Surreal, yet so full of love. Thank you for your art. This is beautiful. I hadn’t expected to feel the feelings I had when I saw it. I had all 3 of my children with a c-section. One was a great experience and the other two were very difficult. I hated not being able to hold my babies right away even though I knew they & I needed medical attention. I think you captured it perfectly! My daughter is 5 weeks old and the path to a cesarean birth was fast, but confusing. It was an almost out-of-body experience. My daughter had to be taken to the NICU afterwards so all I got were a few moments with a nurse holding her by my head. I gave her a kiss on thw cheek & said hello … I’ll never forget how her eyes popped open & she looked right at me. Thank you for this piece! Desde lo más profundamente de mi alma y mi vientre, con todo mi corazón… GRACIAS !!! Vivo en Costa Rica, América Central, cómo funciona la compra ?? Me interesa muchísimo !!! I love this so, so much. I had a homebirth cesarean nine months ago. As part of my therapy for processing the birth, I needed to find a special item to represent it. I just purchased the pendant form of this piece. It is so powerful. Thank you.